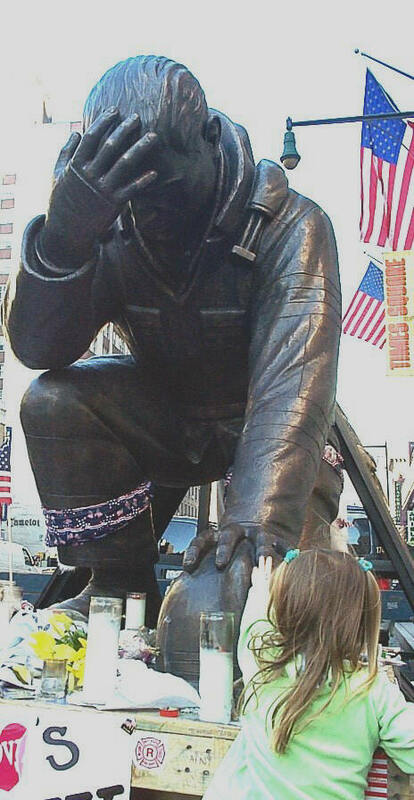 There is a statue of a fireman kneeling in sorrow and great pain parked on the a busy street of New York City. It is a painful statue, full of sorrow and angst for those the "heroes of the moment" could not save. It is a tribute to the 343 firemen who died in the September 11 Terrorist attack, and a salute to all the brave police, emergency and fire personnel throughout the nation who risk their lives daily for others. I took my three-year-old granddaughter by it the other day. I wanted to get some pictures of the sculpture which sits on a trailer against the curb on busy 8th Avenue close to Times Square. It faces South toward where the Twin Towers once speared magnificently upward toward the heavens. Now, there is a blank in the sky, only a faint memory of what was a signet of America's wealth and power. In a peculiar set of circumstances, the 2,700-pound statue was being held at JFK for its final leg to its destination to the Firefighters Association of Missouri when the Terrorists attacked the World Trade Center. After the attack, Matthews International, the foundry that designed and built the bronze statue, donated it to New York City. They agreed to construct another one for the Missouri Association, which was in harmony with Matthews about donating the statue. As the smoke pillared up from the wounds of the World Trade Center, the statue stood in solemn vigil, looking down at the site, a reminder of the pain and sorrow suffered by those who saved thousands that day. In the history books, only the total number of dead will be remembered. For Pearl Harbor that number is 2,403 --the brave who died on December 7, 1941 in the holocaust of the Japanese surprise attack. The World Trade Center final count is not complete, but the number is over 3,000, but being adjusted each day. Few will see the statistic listed in the history books of the 25,000 people who escaped, thousands owing their lives to the quick and professional guidance of the firemen, police and emergency workers who were at Ground Zero to sacrifice themselves for others. While the statue exhibits the sadness of a man in pain, it also radiates the glorification of life for many. In my own case, the police and firemen forced a group of us away from the burning building where we stood with mouths open as bodies flung themselves out of the burning structure. As the fire raged, the firemen and police drove us down a narrow street, distancing us from the building. Then, a moment later, one of the largest edifices to freedom in the world collapsed. Debris smashed everywhere where we had once stood. I know the power of remembering not the pain of those that weren't saved, but the gratitude of the thousands who were. I was one of them. My granddaughter also knew intuitively something only a child feels about the firemen, the police and emergency workers. Normally, she is shy and reserved about going up to things. It is an instinct children who grow up in New York City quickly learned--it's called caution. However, she fearlessly walked up to the statue and immediately reached up to touch the hand of the 6-foot by 6-foot kneeling bronze fireman--as though she felt his pain and sought to give him solace. Along the side of the statue, which sits on 8th Ave on a trailer bed until more permanent housing can be allocated for it, is a tableau of police, emergency workers and firemen. Each is doing his or her job--saving the innocent, the helpless. 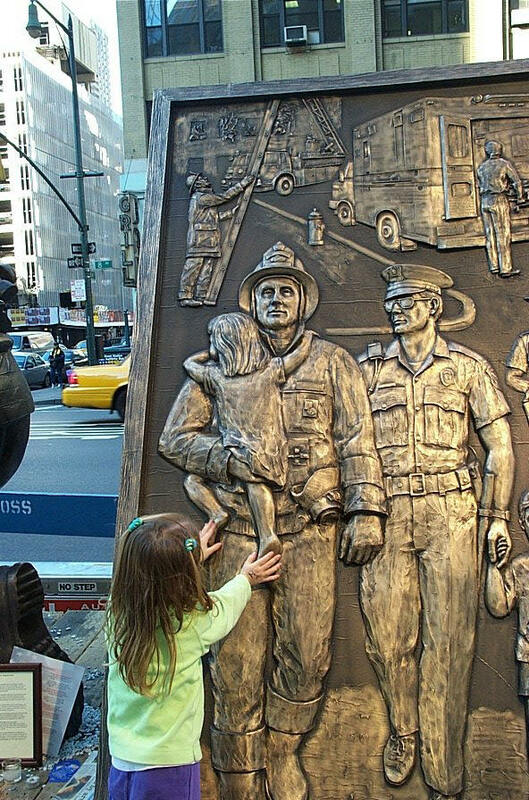 The artist who designed the piece was wise to depict the firemen and police and emergency crews saving the most precious commodity any nation has--the children. Again, my granddaughter walked to the tableau and reached up and touched both the young girl the fireman held in his arms, and the young boy the policeman was keeping in the "safe zone." I wondered what thoughts were running through Sarah's mind as she peered up at the relief and saw the Sentinels of Vigilance protecting the children from harm. I realized more deeply at that moment that we, as a nation, forget to remember that the key front-line of our security as a nation is in the hands of our local fire and police, whether we live in a town of 10 million, or a community of a few thousand. They are true Sentinels of Vigilance, keeping their eyes and ears open twenty-four hours a day to protect us from all forms of harm. Terrorism's goal is to strike fear, intimidation and complacency in the hearts of those it attacks. There was none of those elements radiating from the statue. I saw the opposites--courage, conviction, action. More importantly, I saw my grandchild's fearless reaction to the statue. It was as though the statue wasn't made of bronze, but of flesh and blood. I wondered if my granddaughter could feel the spirit of life in the statue--if she knew it was alive and not just cold metal. Her investigation of the metal was through touching--as though she knew she was safe and secure in a city noted for its paranoia, its caution, its hesitation. I hoped there was a communion between the two. I wanted to believe, as children do, the spirits of the 343 firemen, and all the police and emergency workers who perished that day to save tens of thousands, were as alive as my granddaughter suggested they were by her affection toward the cold metal. 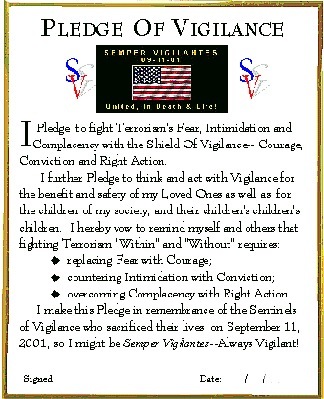 Semper Vigilantes, I thought. "Always Vigilant." Yes, the Sentinels lived! 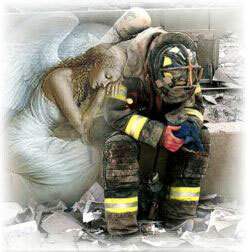 They stood watch over the children, their parents, and all who were within their watch. Go To December 11: "Playing Terrorists And Indians"